Steve Jobs is a good movie; let’s get out of the way right now. Written by Aaron Sorkin, directed by Danny Boyle and starring-wait for it-Michael Fassbender, Kate Winslet, Jeff Daniels, Seth Rogen, Katherine Waterston, Michael Stuhlbarg and Sarah Snook. A biopic about a high profile personality that changed the way we live, it followed a familiar path for awards season hopefuls. Launched first at Telluride Film Festival, and then given a limited release where it scored the highest per screen average gross of 2015 before opening wide to have it on everybody’s mind when award nominations were considered. Sadly the film did not open with big numbers in America and was pulled from wide release after only two weeks before limping through foreign territories. Kate Winslet and Aaron Sorkin did pick up Golden Globes for their efforts and the film did receive two Oscar nominations but compared to the similar The Social Network, Steve Jobs was seen as a failure. This is a shame because it boasts the same kind of quality we’ve come to expect from all involved. Steve Jobs is not really supposed to be about the man we all know; sure it takes facets of that myth that we know all and sprinkles them throughout. It’s widely reported that he may not have been a very nice man, at least not in the beginning of his career and the film asks an age old question. Can only great things be done by people who are so driven they cannot sustain any sincere and worthy relationships. The film is structured around three acts like a play with each act taking place behind the scenes leading up to a presentation to launch a new product. I could tell you what they are but it doesn’t really matter. The film is about a father and a daughter, there’s a lot of noise about, various work colleagues and what their relationship was to Jobs, how they changed him and were changed by him, whether they pushed him into failures or better decisions. None of it is as important as the relationship between parents and children. Mackenzie Moss plays Lisa in 1984 when Jobs wants to put a personal computer in every home and change the world. He’s young, ambitious and furious that ex-girlfriend Chrisann Brennan (Katherine Waterston) is claiming her child is his. Seth Rogen is Apple co-founder Steve Wozniak who is trusted and cared for by Jobs seen as someone very tech-minded but not necessarily as strong willed as Jobs. Apple CEO John Sculley appears at the launch to offer advice and show his support, they have a warm relationship. Backstage Andy Hertzfeld (Michael Stuhlbarg) is being pressured to fix glitches or face consequences as an original Mac team member. Some people are treated well by the icon, others stand up to him, and others seem to know how to deal with him. Only one is truly able to communicate with him and that is marketing executive Joanna Hoffman played by Kate Winslet. In every subsequent act the relationships Jobs has with these people changes, arguably one for the better, but the relationship with Hoffman never changes. She is his confidant, his moral compass and while her patience wears thin as the years pass by she never leaves his side or stops being close to him. If half of what this film says is true Joanna Hoffman would be a fascinating person to meet and talk to. Jobs remains an enigma played as a real man by Michael Fassbender with volatile emotions but always able to keep something to himself. We see him angry, his pride hurt, his mind frantic for a way to win, smug in victory. The intelligence and energy of the man are on display but tellingly there may only be one genuine significant smile throughout the film. Talk about driven but for true thoughts and feelings maybe only Joanna knows. Kate Winslet plays her as firm when she needs to be but gentle as well, she appeals to his good side in a way most people wouldn’t dare. Ripley Sobo as Lisa in 1988 and Perla Haney-Jardine as Lisa in 1998 effectively convey a child struggling to be acknowledged by their parent in some way and the anger and confusion that will result from that. Their story is the one building to a climax, not Jobs triumphant return to Apple. Rogen has an opportunity here to sprout Sorkin dialogue and be in a different type of movie and acquits himself well. Possibly now as celebrated and recognised for his contributions as Steve Jobs, you don’t ever hear too many stories about Steve Wozniak being an unpleasant person to work with and there is something in that given quiet dignity in Rogen’s performance. Jeff Daniels who got to play leading man on Sorkin’s The News Room here is an unwilling antagonist as John Sculley. The Sorkin scripted showdown between Sculley and Jobs are riveting but far more important are there scenes in 1998. 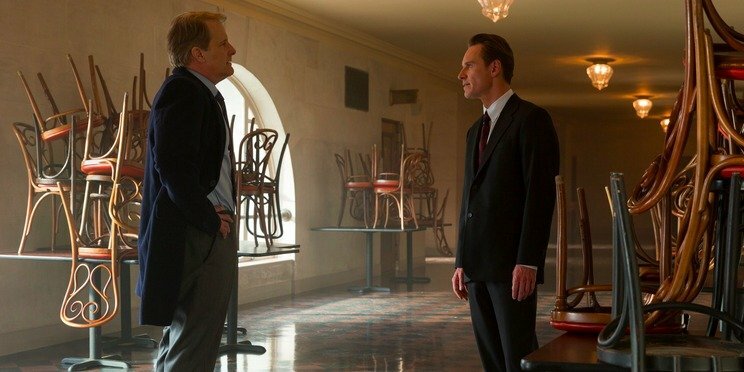 I still can’t shake that for all the talking that goes on in a Sorkin screenplay, Fassbender’s main achievement is to convey so much of Job’s growth in subtleties. One of the greatest actors working today, Fassbender is so consistent we may start taking for granted how good he is. Sorkin writes clever dialogue for smart characters but always with an emotional through line, this is another tour de force by him. After David Fincher’s collaboration with Sorkin yielded The Social Network, Danny Boyle being attached to this movie sounded like an exciting prospect and Boyle doesn’t disappoint. Lacking most of his more energetic flourishes from other films there has still been distinctive technical chances that make the film look and sound interesting and reflect the growth of the technology and the characters in the story. Cinematographer Alwin Kuchler shoots in 16mm for the 1984 scenes, 35mm for 1988 and digital in 1998. At the same time score composer Daniel Pemberton used analogue synthesizers for the 1984 scenes, a more orchestral score for 1988 and digitally produced music for 1998. These are all great touches that you stop noticing after a while but help create mood and reflect the changing of time and characters. Similar choices were made in terms of production design and where each launch would be set. This is high end filmmaking that can’t be faulted, not only does it look great but it serves a purpose. For example notice where late important conversations occur in and with whom in each act. Act I a walk around outside from one building to the other. Act II down in the bowels of a theatre in a dark hallway. Act III in a high up in a rooftop carpark out in the open again. There were better films that came out during Oscar season like Spotlight. Something is off here, maybe Jobs himself remains too aloof or maybe we can’t care too much about rich business people being mean to each other. Maybe the people involved have delivered for us too much that we now expect more. If you haven’t seen it, give it a chance the film effectively and movingly tells a story about a father and daughter reconciling and maybe a man who finally figured out what was truly important. I feel so negative about this film, despite many positive reviews. I concede that the cast is potentially great, and the director very experienced (though I am not a Boyle fan) but I just don’t care anything about Steve Jobs. Certainly not enough to spend a couple of hours of my increasingly short life watching a film about how he got where he did. No reflection on your review though, which was most enjoyable. Given the glaringly obvious typos I just found in it, that is most kind Pete. A professional critic would be able to put their finger on what is missing and articulate it or argue why it is great. Alas I agree that Jobs the character in this movie, I know little of the real man, is just not very likeable despite his arc. I enjoyed the film but your rejection of it I believe to be sound. Sorkin soliloquy we meet again! Rogen and Winslet acquit themselves well. Perhaps that is because their characters are so likeable. Steve Jobs comes across as a very difficult and rather self absorbed fellow indeed. It is very hard to understand the character’s motivation behind his actions. Dude chill out. You are loaded, people idolise you and you look like Michael Fassbender.